Comments: Julia Kimberly (Nee: ) | CN United States | 1851-1900 | Comments: This photo is in an old Ralph-Sedgwick Album. 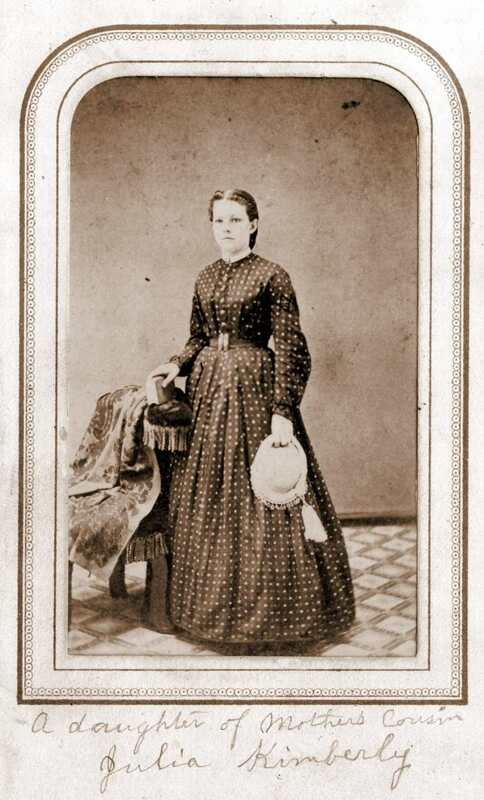 The caption reads “a daughter of mother’s cousin, Julia Kimberly.” Mother refers to Esther Hart Tyler, born in 1812, daughter of Orre (Amos Jr.) Tyler and Jerusha Johnson. (Esther married Jason Sedgwick.) The photo is undated, but we estimate from the style of clothing and such that it was taken sometime in 1868. Julia Kimberly (born 1852) was the daughter of Delia Moss/Morse (1818) and Roswell Kimberly (1810). Delia was the daughter of Esther Johnson (1786) and Alvin Moss/Morse (1785). Esther Johnson and Julia Johnson were sisters and the daughters of Daniel Johnson (wife unknown). The back of the picture says Prescott and White, No. 368 Main Street, Hartford, Conn. In the top right corner, it says “Pictures of all kinds, Copied & Enlarged.” In the lower left hand corner, it says “Imperial Cards, A Specialty, Sarony’s Patent Posing Apparatus used.